I’ve been making films professionally since 1974. On the whole, the entire experience has been fulfilling, challenging and a ton of fun (except for three days in Cairo, 18 years ago, when our equipment was confiscated by Egyptian airport customs). One of the many things I’ve enjoyed about filmmaking is its unpredictability. Whenever you start a new production (no matter how much you prepare) you never know exactly what you’ll encounter. That was certainly the case in 2012 when I began research for our documentary FLIGHT: The Genius of Birds. This feature-length film explored evidence for intelligent design as revealed though the biological machines and systems essential to avian flight. Early on, I watched hundreds of Youtube videos (National Geographic, BBC, etc.) in search of inspiration and an overall plan for our photography. I started with the obvious choices: eagles, hummingbirds, hawks, and Canadian geese—all majestic creatures I knew we’d pursue during the course of production. Then I stumbled upon a short video called Murmuration. This five-minute clip had no script or narration. It was just a mesmerizing look at a huge flock of small birds in flight. European starlings. They are slightly larger than sparrows and common throughout much of the world. I had no idea they would become the stars of our film. On winter evenings, starlings gather into enormous flocks before settling into the trees to roost. Not surprisingly, they attract the attention of predators, including hawks and falcons. To confuse their attackers the birds fly in spectacular oscillating formations that are constantly changing shape and position in the sky. The unified precision of their movements was like nothing I’d ever seen before. We ended up working with Dylan Winter, a former BBC cinematographer. Dylan photographed some spectacular scenes in the moors and wetlands near his home in England. Jerry Harned and I also had a chance to film the birds in Modesto, California. It was an incredible experience to see and hear (the sound of 20,000 birds flapping their wings at once is indescribable). This month’s JOHN 10:10 PROJECT featured film is a compilation of highlights from many evenings of photography. The starling murmurations are truly wonders of the natural world and a sensational display of God’s creative power. Lad Allen is co-founder of Illustra Media, a motion picture production ministry based in Southern California. He has produced, written, and directed more than 100 films and received several international awards. Illustra documentaries Unlocking the Mystery of Life, The Privileged Planet and Darwin’s Dilemma have helped popularize the scientific case for intelligent design. These films have been translated into more than 20 languages and distributed throughout the world. 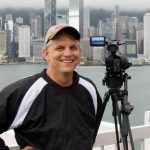 Lad has also headed production on a series of documentaries based upon Lee Strobel's best selling books The Case for Christ, The Case for Faith and The Case for a Creator. His other productions have included ORIGIN: Design, Chance and the First Life on Earth and The Design Life Collection—a documentary trilogy that explores evidence for design and purpose in the animal kingdom. METAMORPHOSIS: The Beauty and Design of Butterflies, FLIGHT: The Genius of Birds and LIVING WATERS: Intelligent Design in the Oceans of the Earth are currently in worldwide distribution. Lad was previously director of film production at Campus Crusade for Christ and Moody Institute of Science. He lives in southern California and has enjoyed an extraordinary 40-year marriage to his wife, Joni (the most patient, understanding woman in the universe). They have been blessed with four adult sons. Copyright 2017 Illustra Media / La Mirada Films | ALL RIGHTS RESERVED | Seattle Web Design by Sayenko Design.